John Gould (1804-1881), like his contemporary James Audubon, was a skilled illustrator of birds. He published eight folios of Birds of Australia and many other folios of birds from all over the world, containing over 3000 color plates of birds. His work would merit the critic’s praise of virtuosity and finish. 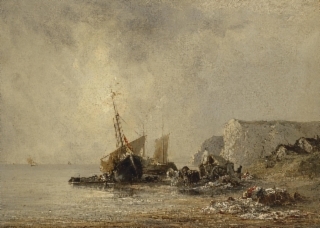 view of the seascape: “The Needles: Schooner Aground was by no means without merit. The painter had evidently seen the work of Bonington.” [HSH 238/257]. Richard Parkes Bonington (Britsh 1802-1828) was a romantic landscape and seascape painter. He won a gold medal, as did John Constable, at the Paris Salon on 1824. So in the end, Jenkins admits that for all his sarcasm and fussiness about some works, he joins those who reassess work as time passes and tastes change. Jenkins “was less keen on Angry Seas off Land’s End.” [HSH 238/257], so perhaps the rendition of that subject in the Duport Collection was not so masterly as this J. M. W. Turner vision of the powerful waves off Land’s End. While John Gould made the preliminary sketches for many of the birds and mammals depicted in his published portfolios, he was primarily a zoologist and entrepreneur. The finished images in his publications were the work of a range of artists, notably his wife Elizabeth Gould, Edward Lear, Josef Wolf and Henry Constantine Richter. See .